NEVER UNDERESTIMATE THE power of music, turtles and tattoos. We had a young woman in the store yesterday looking at our ukuleles. Second String Music has the amazing Luna ukes, and they are extremely popular. She was staring at our ukes when she got a faraway look in her eyes. "Oh," she said. "Look at this one. It has a turtle on it!" She smiled and said, "Don't worry, I have a sports bra on!" Then she promptly lifted up her shirt and showed us the tattoo on the back of her shoulder. She got it to honor her father, who passed away recently. It's a turtle. And it's beautiful. She's already enjoying the beautiful Morgan Monroe mandolin she just bought from us. 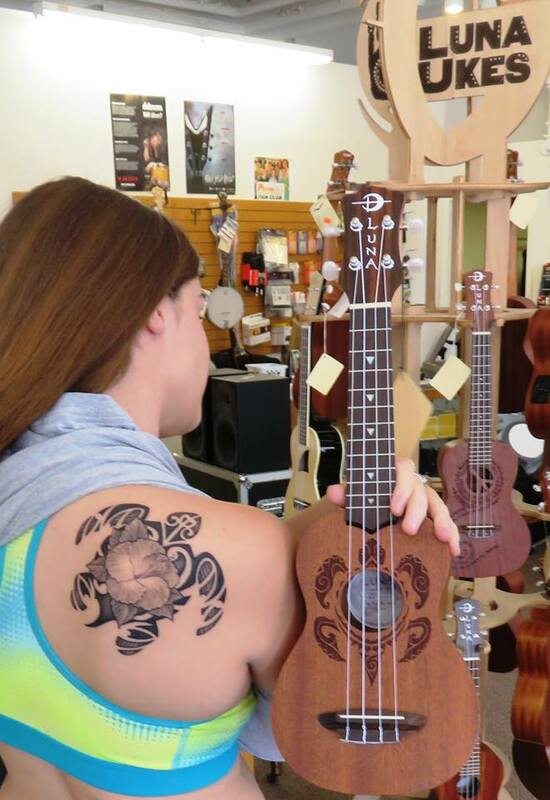 She's been thinking about the uke for a while, and the turtle design cinched it. I have a feeling her musical pursuits are helping her cope with her father's death. There are many ways to deal with stress and life's ups and downs - music is the healthiest and most productive. We're happy she's strumming away and exploring new worlds.